June was a hot month. Temperatures soared and in order to beat the heat, t-shirts were required. However, as an owner of many Canucks jerseys, the temperature was the last thing on my mind as the team marched toward their first Stanley Cup. I love wearing them, especially on game days. When the Canucks got into the Stanley Cup Finals, the fact that it was June and it was bloody hot did not make me rethink my fashion choices at all. I had been waiting to wear my jerseys on incredibly hot game days since I was 8 years old (the one out of place hot day in late March doesn't count). I wanted late round playoff hockey, and the jerseys to go with it. I don't care what the occasion is, I love wearing my Canucks jerseys. So much so that I swear to all who read this, I will ONLY wear my Canucks jerseys from now until the end of the #ReplaceTheKB contest. "Flying V", "Skate", "Orca", "Orca that feels it has to specify where it's from", I got variety, so it won't be a problem. 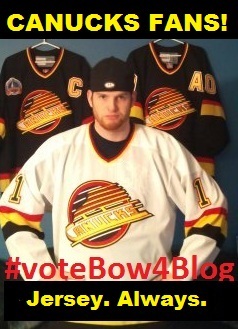 I just hope I don't have to attend any events where a Canucks jersey isn't really appropriate garb. I will not leave my house without a Canucks jersey on. Game day or not. That is my promise. I am on twitter (@jbowmancouver) or as the French would say "sur twitter". I can't speak French, I just use altavista translate. Cody Hodgson & Liev Schreiber : Two Journeys?